Mob Rule - NOT OK! Just recently this poor mite was brought into us in such a poorly state that although he received immediate treatment, we were surprised he was still in the land of the living 24hrs later! He had been found by a chap who spotted something being mobbed by crows in a local public car park. Our caring finder didn’t actually see the Owl at first - initially he just heard a lot of noise and activity coming from the group. However curious to find out the reason for the row he ventured closer and on inspection, realised beneath the unruly mob was a Tawny Owl, which was being progressively attacked. So, he gathered him up and brought him straight to us. 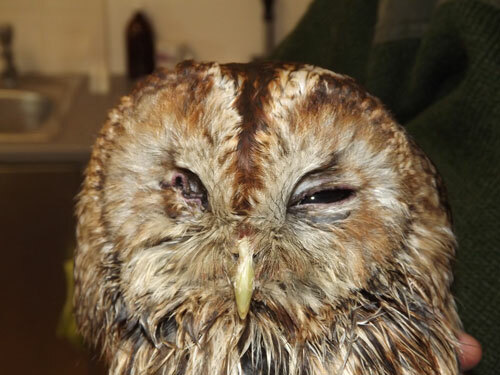 The condition of the owl was so bad we took the owl straight to our vet Paul, who was also not very hopeful of a survival. The crows had actually pecked one of the eyes out of the poor creature, who was found to be extremely thin and week - no doubt the reason he was unable to escape the attention of the corvids in the first place, and no wonder a group of crows is called a murder! The mobbing of owls and birds of prey generally by crows & rooks is pretty much a normality, the reason being thought simply to chase the owls away away. Normally the birds of prey respond by doing just that but as this story demonstrates, if too weak to do so, worse things often follow.